Well, this one slipped through my fingers....but I do have a free pattern site for you, go here, some awesome Thimbleberries patterns. Don't forget the PICK Four Blog hop tomorrow, look on the right to see where you need to go. I guess since all of my sewing is not all over the kitchen table and counter he feels the house is clean. Hummmmmm (I should have told him that I worked so hard all day and was tired)....HA!! Nope, no quilting going on here!! I have a little petite Canadian friend responsible for this!! Don't forget the "Pick Four" blog hop, see right sidebar. Saturday as I was thinking (I know....I get myself into more trouble)..... I came up with this idea. 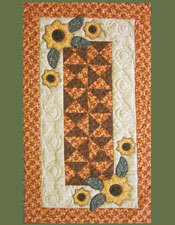 I used the Accuquilt Go Circle die, using the middle circle (3" in diameter) and came up with this table runner. If you would like a tutorial, give me time and I can come up with one. It is done by rows, starting with the top, you blanket stitch around each circle ( top only), See how easy it is???? Then you just work from row to row...and I use a glue stick to glue down the next row....let it dry and then blanket stitch....easy...easy...easy. Enjoy your day and don't forget about the "Pick Four" hop and giveaway below. PICK FOUR BLOG HOP!!! AUTOGRAPHED BOOK GIVEAWAY!! What a wonderful day for a Blog hop and week. I was so excited when Sue asked me to be a part of this hop...so here is her book. Here is the unveiling of the quilt I have been working on. What a fun pattern Sue! The instructions were easy to read and the pictures were great!!! I am a picture person to be honest. I am not going to tell you much about this pattern except that she has a fun trick to this quilt pattern. Don't want to spoil the surprise for you. You can get the book at LQS's, Amazon, and Martingale &Co. or maybe win one here??? Or there? So in your book you said that you had walked by a store with a quilt in the window. That you had to go and take a look and from that moment it was history. Your love affair of quilting started. 1. So...did you take classes or are you self taught? Yes is the short answer! I started by teaching myself, then took a few classes, then moved house but carried on alone and finally enrolled for some more classes a year after we moved so I could unlearn all the bad habits I'd developed. 2. What do you use for inspiration. In your book you used a teddy bear. That's an interesting question. I wish I had an interesting answer, but the plain fact is I don't know, ideas just seem to appear from nowhere. Why did you only chose four colors? I think it's because I'm a control freak. If I try to do a scrappy quilt, I find myself trying to organise the scraps somehow into colour ranges, or types of pattern or whatever. The only way I can truly do anything scrappy is to put all the pieces in a bag and make myself use whichever piece I pull out each time. Don't tell anyone though, but sometimes I even cheat and put one piece back and pull out another one. I always have trouble looking at a random pile of fabrics and visualising a finished quilt from them. Now I know that many people will be gasping in horror at this whole answer, so I do hope I haven't lost you too many readers and followers. 4. How did you come about writing a book? 5. How long did it take you to write this book, from start to finish? The whole process took about 18 months from start to finish, but a lot of that time was hurry-up-and-wait time for me. When I got the contract from the publishers, Martingale & Co, they gave me 6 months before I had to submit the manuscript, finished quilts, etc to them. "Easy", I thought. "No problem", I thought. Well I can tell you now I was wrong. Oh so wrong, but it was definitely made easier by friends who volunteered to make some of the quilts, and others who tested blocks for me. Thanks Lis, Drew, Kim and Roberta. After I sent everything to Martingale, there was a fairly stop-go sort of period of about a further 6 months, while they did all the things they had to do to turn what I said into what I meant to say, then it went to the printers and then came the exciting time when publication day finally arrived about 18 months after I first received the contract. 6. You have a long arm machine? Yes I have, but it's all driven by computers. I'm not clever enough to be able to do freemotion quilting. 7. Did you quilt most of these quilts in this book? I quilted those that I pieced and Lis and Drew, who have exactly the same setup as me, quilted the ones they made. 8. You had mentioned that you never really like sewing, what has changed your mind? What, do you mean that piecing and quilting is sewing??? 9. When not quilting, what do you do? Think about quilting. Did I hear someone at the back suggesting I have a one-track mind? 10. You and your husband are retired? Did you work before? Yes I worked as a programmer/systems analyst first and then in the space and communications industry before moving into recruitment and sales, which was something I really loved doing. You also said I could add in any other questions, so, in case anyone needs to know my favourite food is chocolate! Now for the fun part!!! I get to giveaway an autographed book of "PICK FOUR", just leave a comment and do go by and visit Sue's Blog, Quilt Times, it would be nice if you followed her but that is not a stipulation of winning. Be sure to go by and visit Darlene at "Sewcalgal" tomorrow and thanks for joining us!! I will pick a winner on Sept 3rd. I hope all of you were safe during Irene??? EARTHQUAKE IN STAFFORD, VA CAUSED BY WOMAN JUMPING UP AND DOWN WILDLY!! Look what I walked away with.....go ahead and laugh to yourself. I know, I said I never would do another screen bag.....I couldn't help myself....it is orange!!! So...I tried it out on a square I made to help a little gal (you can read about it here if you want to help). This stuff is great. Would show you my block but it is in the mail box waiting to be mailed out. Now...you will find on your right a poll about Accuquilt, do you prefer to use the Go cutter for applique or for piecing? I hope you all stopped off at Pat's, Silver Thimble Talk, for the Pick Four blog hop...the link is on the right as well...just click and you will be transported there. I have had several people email me and ask "What'sssssss uppppp"! Wondering where I am. Have you ever heard the saying "I am so busy, I don't know which end is up"? Well...that is me right now. I was away for two days (missed the earthquake). Came home and hit the ground running. I am preparing for two meetings today. (which we had another small earthquake last night at one in the morning). One is with the presidency of my little Beehive class and this is what I have planned for them. That teired center piece will be fill with truffles (my first time making them), lemon bars, and fudge (turned out a little tooo done). I was going to make a table cloth yesterday but thought I am stretching myself a little thin so I got a piece of fabric my son sent me from the Philipines and made it work. The glasses were given to me by a friend and I had to dig in my storage boxes for the little plates. After our meeting I have another meeting with the Leaders over these beautiful young women. I have a few things I have gotten organized for that as well. So....maybe .... just maybe...if I am lucky, I might get some sewing in tonight or.....if I chose, just put my feet up and sit a spell. Can you tell I love my little young women? Be sure to check out Quilt Hollow (link on my sidebar) for her "Pick Four" review and giveaway...but remember me on Sunday...I will be waiting for you! PICK FOUR BLOG HOP STARTS TODAY!!! I still have some quilting to do on a few squares, Mr. Horizon and I were not getting along Saturday so I just closed down shop. My husband says it is operator error (how could he??? )...how could I???? I just love green and pink together, this quilt is pretty scrappy....but I love it! Here is what I am doing with the buttons from ButtonMad. I finally gave up looking for the buttons and just adapted my pattern of Sun Bonnet Sue's to the buttons that just arrived. I had a different friend come over yesterday. She is just now getting into quiting and her question was.....when you do the backing of a quilt, do you worry about where the seam is when you have to put piece the backing together. She felt it had to be centered in the quilt. So my question to you is, does it matter? sent me these wonderful buttons and earrings. Bad news is for some reason that one earring has been flipped over each time I go and retake this picture.....so I just gave up. Awesome earrings. Awesome Buttons. Thanks so much Jennifer. So...the good news is that I was laying in bed this morning and I came up with a brilliant (even if I say so myself) idea to use those buttons. Bad news is, I can not find the other buttons that Button Mad sent me.....I have searched high and low. More bad news, they are with the buttons I had for my Be Attitudes quilt...and believe it or not, I was going to finish up the borders today and get it going. Good news is....I had misplaced all of my coupons.....I found them...whohoooo I search and search for these buggers. More good news, I ordered these fabrics from my sister's store, Inchworm Fabrics, I ran out of this fabric a few post ago. Now I can get busy and finsh up this quilt. I had the most wonderful friend come over yesterday (I have to say that because I think she is starting to read my blog...wink!! wink!!). She asked me what do I do with all of my quilts and why do I keep making them. She says she only does a quilt with a purpose. She knows exactly where it is going in her home and if she is making a present for someone. So....I am asking all of you, why do you keep making quilts? What is your drive? I have a poll going on the side bar (you can choose more than one answer), but would really love to hear more than a few words of why you quilt. Then I noticed they had a slice ( cutter) for 99 dollars, now that was a good price....it pays to pop in there occasionally. Now...most of you may see a pattern with me. I have my manic stages where I go crazy and get a lot done and then weeks like this one where I am not being very productive. No....I am no bi-polar or manic, it just sometimes I have weeks where I am taken out of the home more than others....and I will confess I am prone to headaches like a lot of you are, sometimes I can continue to sew through them and sometimes I will just nurse the dog out of them...(that means taking it easy doing not much of anything). Am I complaining, hope not, just a part of life and well...like most of you, we roll with what we are given and do the best we can. Each morning I wake up and am very grateful that I have been given another day to live...isn't it great!! I know you are wondering what I am doing with all of that...that...well...that!!! A month or so ago Robin sent me a note pad just like the one above (different fabric). I told her that I so loved it and if she didn't mind if I tried to mimick it and make some of my own. Well.... Robin being the generous person she is, sent me the pattern.....now you can have it, just go here Fast, easy, fun...and makes for a great gift because I sooooo love mine. I AM BEING HELD HOSTAGE!! The thing is, I like being held up in my sewing room...what is even more amazing is that I cooked both nights....what a shocker for my husband. Ask my mother, she would have passed out if I had cooked while she was here......sorry MOM!!! I ran out of fabrics today...need more....good thing I know where to go. Then Michelle from Dresden quilter sent me this block to go with MY ME quilt that I am making....thanks Michelle, I love it!! Next, I went and brought some Mod Podge and created these folders for my young women at church....their name is Beehives for their age group. I did this when my mother was here, she helped color. I was so stressed to get these done and then only had two girls show up that evening. Oh well...it got done!! I call this quilt my throw back quilt....I practiced my free motion on it....I am actually pleased with how it turned out but it is far from perfect..... This is the small drunkard's path die for the Accuquilt Go cutter. I used the fabric scraps I purchased a few years ago. I am trying to improve my hand/eye coordination....more control in my hands. So I went up and down the weave with the free motion foot....looks like I was drunk....but I hopefully, got better. I call that repeated pattern that is not quilted the weave. So as I am quilting the fire alarm went off in the house. Scared the bejeebies out of me...I run through the house looking for fire, the only thing I can figure is I was running my machine so fast the alarm picked up on it....HA!!!!! Labels: Accuquilt Go cutter, Drunkard's path, free motion quilting. I felt it needed a bright funky back....and so I had this Samoan Fabric....need I say more???? I have one more quilt that needs binding and then off to quilting again. Robin dropped by my email today and said she had alot of bindings to do, I suggested a binding party but I had already started on my bindings....maybe another day. HARSH REALITY OF A FLUFFER. Today I decided to pull out my Go cutter....yes, I have other things to do , like that binding I showed you....but hey.....a gal can change her mind. So....I have my cutter out, cutting up a storm...and well....my scraps don't seem to be getting any less....infact if truth be told...they are multiplying right before my eyes..... How can that be? They are only suppose to multiply when the lights are out!!! I am a fabric scrap fluffer.....are you? Or are you a fabric stuffer? (I have many of these bags but....I can never seem to tame the scraps long enough to get them all in the coordinating bags). I have a poll on the side, stop by and let me know what you are...or do you want to confess to me. They say confession is good for the soul....so confess away. So...not only am I a Fabricaholic, UFO Hoarder, now I am a Fabric Fluffer! Shewwweee....I feel better now. FREE MOTION QUILTING AT (MY) BEST AND AT (MY) WORST!! Yesterday I had the best time quiling these quilts... all that is left is the binding....and yep, could have done them last night but decided to take a break and sit a spell. ....what fun....my Horizon was just singing away. I finally figured out that the needles I purchased in Amerika Samoa are really no good, especially for machine quilting. I had taken my machine back to the shop at one point and they said, that my needle was no good. I thought, how could that be, I just changed it. I decided that if I can show you what I consider my best work, that I can show you a blooper too....do you notice it? There are two segments....the blooper is in the bottom half..... No, I didn't take it out...but I did notice that when I over think what I am doing....that I would not do that great of a job. So my advice....just relax and have a good time.